Orders shipped by FedEx Home or UPS Ground are frequently processed and leave our warehouse within one to three business days. We do not ship on Saturday or Sunday. Orders shipped using three-day, two-day, or overnight shipping leave in one business day. If your order is time-sensitive, please select the appropriate shipping method to ensure the delivery meets your schedule. In order to avoid delays, please ensure someone will be available at the shipping address to recieve a shipment. How fast will my FedEx package arrive? FedEx SmartPost delivers Monday through Saturday. Most shipments using this method take 6 to 12 business days, depending on your location. Note that the U.S. Postal Service® (USPS) will make the final delivery if you select SmartPost. FedEx 2 Day delivers Monday through Friday. 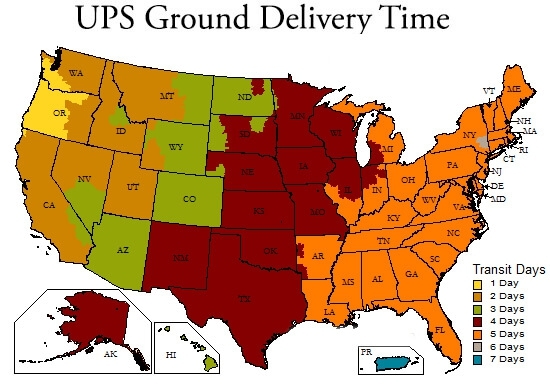 Most shipments using this method take 2 days from shipment date, depending on your location. For expedited orders placed on Friday, Saturday, or Sunday FedEx 2day shipping will begin the following week. For example: An order placed on Friday will ship out Monday and arrive Wednesday. FedEx Overnight delivers Monday through Friday. Most shipments using this method take 1 day from shipment date, depending on your location. For expedited orders placed on Friday, Saturday, or Sunday FedEx overnight shipping will begin the following week. For example: An order placed on Friday will ship out Monday and arrive Tuesday. How fast will my UPS package arrive? UPS 3 Day Select delivers Monday through Friday. Most shipments using this method take 4 days depending on your location. UPS 2nd Day Air delivers Monday through Friday. 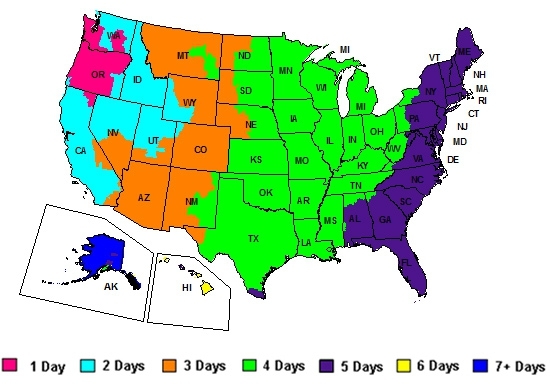 Most shipments using this method take 2 days from shipment date, depending on your location. For orders placed on Friday, Saturday, or Sunday UPS 2nd day Air shipping will begin the following week. For example: An order placed on Friday will ship out Monday and arrive Wednesday. UPS Next Day Air and UPS Next Day Air Saver deliver Monday through Friday. Most shipments using this method take 1 days from shipment date, depending on your location. For expedited orders placed on Friday, Saturday, or Sunday next day shipping will begin the following week. For example: An order placed on Friday will ship out Monday and arrive Tuesday. Why does Royal Jelly need to ship using overnight or two day shipping methods? Due to its perishable nature, fresh royal jelly can only be shipped using two-day or overnight shipping. In addition, we only ship fresh royal jelly Monday through Wednesday in order to avoid shipping delays over the weekend. Please note when ordering fresh royal Jelly that any other products in your cart will also be shipped using 2 day or overnight shipping. 2) Navigate to the orders page. 3) Select the order to see the tracking number. Please note that most orders ship within 1 to 3 business days. Until your order is shipped, the status will display as: “Queued”. If after three business days your status still shows "Queued”, you can retrieve your tracking number by calling GloryBee at 1-800-456-7923. Are you Accreditatied by the BBB? We want to make purchasing as easy and convenient as possible so we accept Visa, MasterCard, Discover, American Express, Money Order, Cashier's Check, as well as Personal Checks. To help ensure accuracy when applying your company’s payments to invoices, please include on your payment remittance, your Customer ID number and the invoice numbers being paid with the payment. Personal checks received without this information will be held until clearance from the bank (approx. 1-2 weeks). Returned check fee is $35.00. How do you secure my credit card online? At GloryBee we believe in preserving your personal information in the securest way possible. All transactions are done over fully secured server connections to ensure your credit card and personal information will not end up in the wrong hands. Is there a order minimum for retail orders? There is no minimum online order for retail. The wholesale order minimum is $200.00. Please visit our wholesale website to request a wholesale account, place orders, and view our wholesale product listings. To change your order, please call us immediately. We will do everything in our power to help change your order, but if the order has been shipped we will have billed you already; items can be returned as long as they meet the guidelines on our return policy. If you want to cancel an order please call us immediately. Call toll-free 1-800-456-7923. What is your liabliity for products? Because conditions of use are beyond our control, we offer no warranty or representation, express or implied, except that all products conform to the description provided by the manufacturer on sales literature or product labels. Our liability is limited to the purchase price paid. GloryBee may be able to ship to your country. Please note that we have minimum export requirments and the retail website is for USA orders only. In addition some countries have strict import requirements and certain GloryBee products may be prohibited from shipping to your country. Please call 1-800-456-7923 for export information and minimum export purchase requirements. Shipping charges for international orders will be calculated at the time of shipment and cannot be calculated on the website. Export shipments are subject to payment in U.S. funds. Honey bees and queen bees cannot be shipped overseas. All freight for export orders must include the cost of insurance. All export orders will be shipped through UPS, unless otherwise specified. Export orders shipped through carriers other than UPS are shipped at the customer's own risk. UPS calculates duty and customs fees at the time of delivery. If you have more questions regarding international shipping, please send us a message using our online contact form. Our website updates product inventory on an hourly basis. In addition we have measures in place to ensure you'll never be able to order an out of stock item. If by chance any items are out of stock on your order, a customer service representative will contact you via email and/or phone. We can either hold your order until the out of stock item comes in or remove the item. • Returns must be requested within 10 business days of receipt. • 15% restock fee will be applied. • Damaged or missing product must be communicated to a Customer Service Representative within 48 hours of receipt. • NO return authorizations, credits, or exchanges will be issued for any food products that have been opened, defaced, or relabeled. • NO return authorizations, credits, or exchanges will be issued for any bee medications, fresh frozen royal jelly, beeswax foundation, skin care products, cosmetics, or books. • All Returns to our Factory Store require original receipt. • Contact a Customer Service Representative or go to GloryBee.com/returns for further detail. • Return freight paid by customer. • Upon return product will be inspected by a quality assurance team member. If it is determined product has been opened, defaced, or relabeled GloryBee reserves all rights to dispose of product and withhold refund. • If product is found to meet our return policy, a refund will be applied to your account, less a 15% restock fee. • All deductions from invoice require prior approval. What happens if I have a quality claim about one of your products? To maintain the highest quality and avoid possible infestation, always store product in closed container and follow storage suggestions on the product specification sheet. If the complaint is due to natural crop variance, we will not accept the return because it’s not a quality issue and cannot be controlled. • Prior to sending any questionable product back, contact a Customer Service Representative for instructions. • Customer Service will file a claim with Quality Assurance on your behalf. • Quality Assurance will review your claim and we will follow up within 5 business days. • Quality Assurance may require a sample or picture of the product if a comparable lot is not available for review. • Return and/or credit are subject to approval by our Quality Assurance. • If the claim is approved, we will follow up with the credit and/or return instructions. The product must be returned in its original packaging and cannot be defaced or relabeled in any way. • Contact a Customer Service Representative for instructions on how to proceed. • We may ask for the foreign matter or debris by sending a picture and a physical sample. • GloryBee does not take infested product back. • Claims must be made within 10 business days of receipt. • Please do not destroy any product until your request is approved. This could result in forfeiture of credit. What happens if one of your products is recalled? GloryBee has full traceability and reporting on every lot shipped and received. We complete biannual mock recalls in preparation for an actual recall. If product you’ve received is affected by a FDA recall, GloryBee will be in contact with you. To qualify for a wholsale account you must apply here and wait up to 3 business days for our sales team to appove your application. Our sales team may contact you with questions regarding your application via phone or email. Orders can be placed by calling, faxing, emailing, or on the internet. We will ship your order via your standard shipping method unless alternate arrangements are made. Route deliveries have scheduled deadlines and orders placed after the deadline cannot be guaranteed for delivery on our trucks. Please contact your account representative with any questions about ordering, order deadlines, or minimums. How will you ship my wholesale order? We deliver orders using our own fleet of biodiesel-fueled trucks whenever possible. In areas where route delivery is not available or for orders that do not meet our minimum route delivery requirements, we offer common carrier (freight), UPS, and USPS Parcel Post, and FedEx delivery. If you require an order via any of the above listed, please discuss the best option with your account representative. How can I pay for my wholesale order? We accept all major credit cards, check, money order and cashier's checks. We also offer terms. Payment is required within payment terms, and failure to meet established terms will result in a finance charge of 1.5%. Past due accounts are subject to NO-SHIP status. C.O.D. accounts will not be delivered without a pre-payment or a payment for the driver. C.O.D. orders without payment for driver will incur a $100 transportation fee and a 15% restocking fee. Payment must be received before product is reshipped. There will be a $35.00 charge for any returned check. GloryBee reserves the right to change account payment status at any time. To help ensure accuracy when applying your company’s payments to invoices, please include on your payment remittance, your Customer ID number and the invoice numbers being paid with the payment. Personal checks received without this information will be held until clearance from the bank (approx. 1-2 weeks). What are your wholesale return and refund policies? • NO return authorizations, credits, or exchanges will be issued for any bee medications, fresh frozen royal jelly, beeswax foundation, skin care products, cosmetics, books or international orders. What are your procedures for damaged or missing items on wholesale orders? If any items shipped via a GloryBee delivery truck should be damaged due to unloading or transporting, the driver has the authorization to return the damaged product to the warehouse. If any product is found to be missing, the driver has authorization to write a credit. If a GloryBee driver is not present, you have 48 hours from receipt to communicate damages and missing items to your customer service representative for credit and/or return. Communication after this designated period will not warrant credit and/or return. Any damaged or shorted items delivered via a third party common carrier must be noted on the Bill of Lading (BOL) and signed by the carrier's driver in order to file a claim with the carrier. Any additional documentation, including pictures, should be sent to a Customer Service Representative within 48 hours of delivery. In cases where GloryBee arranges freight, and is billed by the carrier, GloryBee will file claims for damages on your behalf if damages are noted on the BOL. In cases where you arranged freight, and are billed directly, you are required by the carrier to file claims with them directly. What happens if I have a quality claim on my order? What happens if a wholesale product is recalled? Please note that some countries have strict import requirements and certain GloryBee products may be prohibited from shipping to your country.